The Charles Owen AYR8 Classic Helmet is the latest blend of tradition and technology. This low profile helmet combines fade resistant velvet side panels with a vented velvet center for maximum airflow. It's the perfect combination of classic and cool! Stay-soft deerskin harness with GRpx technology for a snug and secure fit. 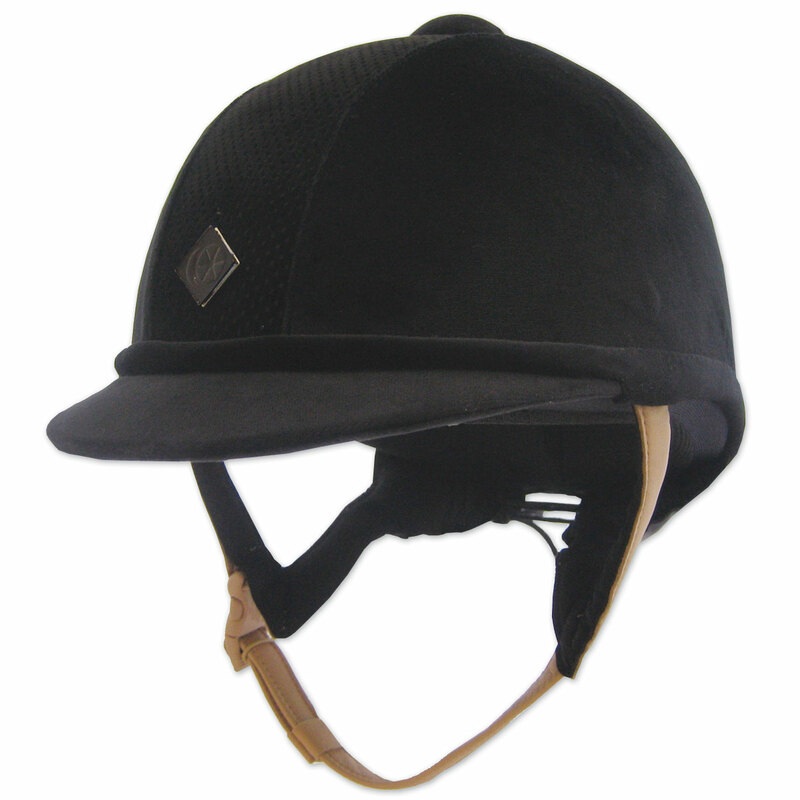 Gently rounded brim and centrally positioned logo flatter your face, while the back of the helmet has a traditional ribbon to complete the polished show ring look. Super soft headband is embedded with high tech silver ions, providing built-in antimicrobial protection, keeping the helmet hygienic and free from odors. Charles Owen AYR8 Classic Helmet is rated 5.0 out of 5 by 9. Rated 5 out of 5 by tayloranngenevieve from Beautiful Helmet This helmet has a classic look, fits perfectly, and is very comfortable. I love the light brown straps and the bow on the back. The leather straps are very soft and comfortable. I cannot wait to show in this helmet - it gives a classy hunter look! Rated 5 out of 5 by AtlanticMan from Elegant and classy I've noticed most people at the local hunter shows have the charles owen helmets with the silver embroidery on the back. Although I wanted my show helmet to be in style, I was really not a fan of that look, and I think they look best on young riders. Now that I'm showing as an adult, I wanted a more sophisticated look. This ary8 classic was a perfect blend of what I wanted, and fit significantly better than the less expensive similar helmets. Rated 5 out of 5 by Par82 from Superior modern helmet with a classic look I loved my old helmet (which I kept WAY too long - 20 years!) and haven't liked the look of modern helmets. I'm so glad CO made a classic-looking helmet with the button and bow. This helmet is SO light - again, comparing it to my extremely outdated one but it just feels a million times lighter. So far I haven't worn it in summer but I haven't had a sweaty head yet with it. It looks great on and doesn't give you the mushroom head look. Rated 5 out of 5 by Tullibard from Gorgeous comfortable hat I had one of these for five years and thought the classic might attract dirt, hair etc because of the velvet cover, but no...this stays nicer looking than the regular one. Very comfortable harness. Would strongly recommend for those who prefer the classic look. Rated 5 out of 5 by Nutmeg Lady from beautiful helmet A little pricey, but fit & look are beautiful. Have the older Hampton style, but bought this for the venting system. Rated 5 out of 5 by CSH Lover from Love this helmet !! This helmet is cool,light and confortable ! There is a huge difference in the fit and feel compared to my old helmet! I am very grateful my friend introduced me to Charles Owen! Rated 5 out of 5 by superstardressagequeen from Luxury meets functionality!! If you need a nice helmet look no further! I debated over several other helmets for about a year before deciding on this one. I bought this helmet mostly for showing, but after using it a few times I have gladly hung up my old Troxel and IRH for this one. Comparatively it has a nice low profile so it’s not too bulky. I feel sporty, luxurious, and stylish in it. Charles Owen club all the way!! Rated 5 out of 5 by horsiegurlz7 from SO STYLISH! the most beautiful of CO helmets with superior ventilation! helps in the Texas heat ( only use @ shows ) Overall awesome!! Rated 5 out of 5 by mac1 from Most Comfortable Helmet Ever! Love it! Love it! Love it! I just had 6 inches of hair lopped off, and I found that my old helmet no longer fit, so I had to purchase a new one. I decided on the Charles Owen AYR8 Classic. I used the measuring chart provided by Smart Pak , and it proved to be right on the money. This helmet is low profile, with classic good looks. (I love the bow in the back). The fit is truly amazing! It fits like a glove, snug yet not uncomfortable!